With just his third movie, following Fruitvale Station and Creed, Ryan Coogler has ascended to blockbuster filmmaking. 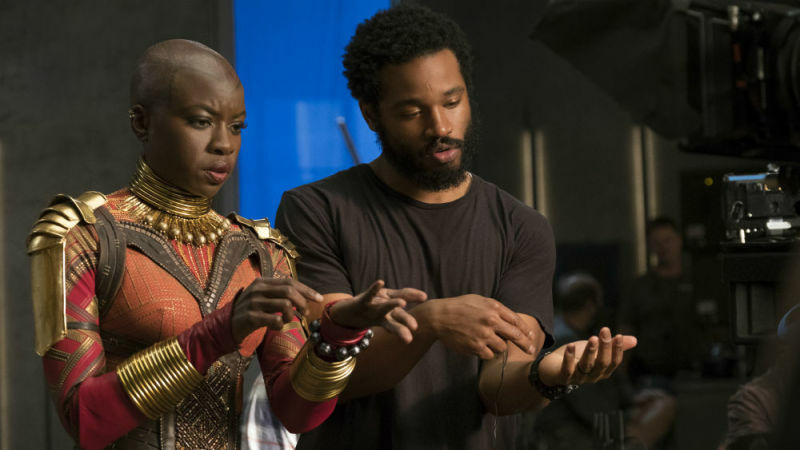 Black Panther isn’t merely a spectacle full of empty CGI calories, dependent on a comedic tone or a setup for a larger story in the Marvel Cinematic Universe. It works as a standalone film outside of the world we’re familiar with, creating a rich world and deep ensemble that makes it arguably the best Marvel movie yet. “The best Marvel movie yet” seems like praise that always follows the latest Marvel film. But upon repeated viewings or further review, many of those films do something very well. Thor: Ragnarok works as a comedic buddy movie. Guardians of the Galaxy presents a new take on the operatic space epic. Ant-Man puts a superhero spin on the heist film. Captain America: The Winter Soldier is akin to a 1970s-style political thriller. On one level, Black Panther works as a James Bond-type of globe-hopping action film. But that’s only one part of the movie. This feels like more of a complete film than its Marvel brethren. Even if we know that its title character, along with his African nation of Wakanda, will be part of the upcoming Avengers films, it doesn’t feel like T’Challa and the cast of characters that make up his world need the rest of the Marvel Universe to justify their existence. A recurring problem with superhero movies — especially early on, before Marvel really broke the right formula — has been that the featured hero wasn’t always the most compelling character in the film. Think about Batman being overshadowed by The Joker in Tim Burton’s Batman film (or even in Christopher Nolan’s The Dark Knight). It probably happened in Thor too, with Loki being the breakout character of that movie. Yet it’s not a criticism to say that Black Panther is largely overshadowed in his own film. King T’Challa is a very compelling character, largely because he’s not like other superheroes we know. Though his story is somewhat fueled by personal tragedy and the death of his father, T’Challa is a king responsible for the well-being of his country. He doesn’t just take it on himself to protect the people of a city or nation; it’s literally his responsibility. However, the world that’s been created around Black Panther and the people he’s surrounded by are all so intriguing that the movie is often more enjoyable when those characters are on screen. Is T’Challa ever more fun than when he shares a scene with his younger sister, Shuri (Letitia Wright), who essentially serves as the Q to Black Panther’s James Bond? 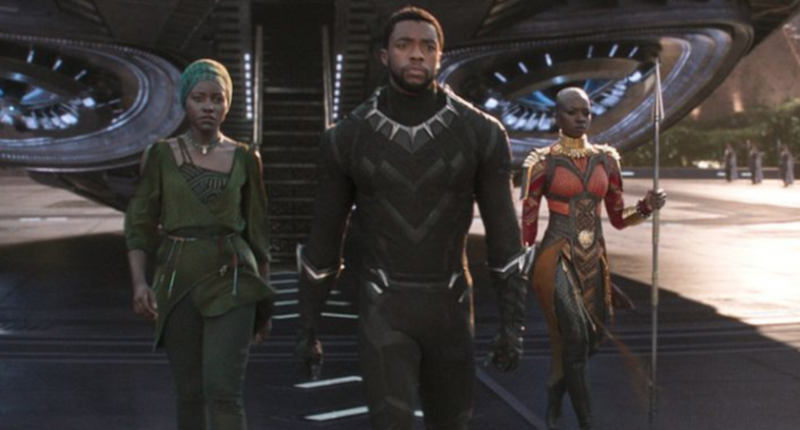 Despite wearing a nigh-invulnerable suit as Black Panther, he’s not above having his ego poked by Shuri, his lead bodyguard, Okoye (Danai Gurira), nor his ex-girlfriend, Nakia (Lupita Nyong’o), all of whom know the man under the crown so well. If Tony Stark is at his best with Pepper Potts, T’Challa has three or four Peppers to keep him in line and fight alongside him. We’ll see more of Black Panther (along with Shuri and Okoye) in other Marvel films, notably this summer’s Avengers: Infinity War, but it’s fun to see the characters (and nation) of Wakanda get a showcase. There will surely be plenty of discussion in the days and weeks to come regarding who is the standout or breakout character of Black Panther. Ask that question to 10 different people after they’ve seen the film and it’s likely you’ll get several different answers. Naturally, many will gravitate toward the noble hero with the sleek suit and cool gadgets. Others will gravitate toward the brilliant young genius who designs all that wonderful technology. What about the woman who wants to affect social change around the world and share what Wakanda has to offer? And some might find Erik Killmonger’s motivation entirely relatable and empathize with him. The choice here for Black Panther‘s standout is the hand of the king, the lead bodyguard for Wakanda’s greatest champion, and general of the Dora Milaje, Okoye. Everyone in the cast appears to be having a great time, enjoying being a part of this movie. But no one looks like they’re having more fun than Danai Gurira as the king’s greatest warrior, thrusting and aiming her spear at anyone who would dare challenge her king or threaten Wakanda. Again, your opinion may vary, along with anyone else you may talk to, but one of the most memorable sequences in the film is a car chase through Busan, South Korea. Black Panther jumping from car to car and his suit absorbing kinetic energy to turn back on the opposition are the most showy parts of the film. But Okoye might have the most amusing scene, quickly transitioning from annoyance to exhilaration as she takes out some of Ulysses Klaue’s crew. As impressive as the world-building is in the film, it’s slightly disappointing that Wakanda and its people (outside of the royal family and servants) aren’t explored all that much. 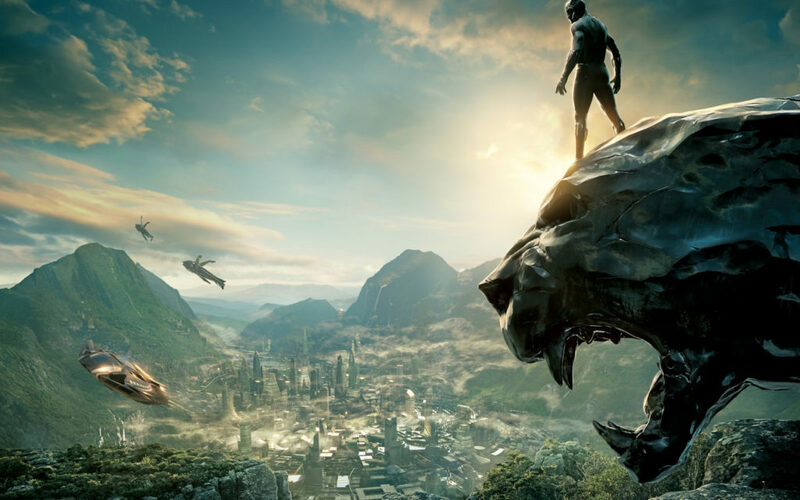 Wakanda is mostly background in the story, though it’s a glorious setting with shining skyscrapers towering and magnetic trains elevated above streets bustling with beautiful people in colorful garments. But we don’t see much below the surface, unless you count the lair where many of Wakanda’s technological marvels are created, where the Black Panther’s arsenal resides, where the heart-shaped herb that gives the king his superhuman abilities is grown. The natives outside the kingdom maintain the facade of a third world country to the rest of the world, but we never meet any of them on screen. Are they aware of their role in Wakanda’s narrative? They see King T’Challa when he ventures outside the main city and the mountainside hologram keeping it from view. Surely, they notice the aircraft flying to and from the kingdom. Black Panther runs more than two hours, so the movie was already full enough without exposition and deeper explanation. But if Marvel still made its “one-shot” shorts, such as A Funny Thing Happened On the Way to Thor’s Hammer to accompany its video releases, it would be fun to see a film about a Wakandan farmer or someone who runs a stand in the city market. Of course, it would also be fantastic to see Okoye, Nakia or Shuri get their own story. But Erik Killmonger (Michael B. Jordan, working with Coogler for the third time) might be the most compelling Marvel villain yet. He may not have the reach that Loki has across the Marvel Cinematic Universe, but for this film, he has a motivation with which many fans may sympathize. It’s far more believable than a megalomanical power grab meant to take over the world. Oh, Killmonger would like to change the world, but not just for the sake of power. This guy wants to right what he sees as a terrible wrong, but he also has some personal grudges to settle along the way. A great villain is often a mirror image of the hero, as well. T’Challa easily could have been Killmonger had their childhoods worked out differently. That realization is heartbreaking to him and he lashes out at those he previously believed were always righteous in their judgment because of it. It’s a compelling moment for the hero, experiencing a much different form of doubt than we’ve seen with other superheroes, like whether or not they can handle the power given to them or the obligation they’ve taken on. With no disrespect meant to the other Marvel directors, many of whom are accomplished in their own right and have done excellent work, Coogler might be the best filmmaker to work on one of these projects yet. Black Panther is presented as more of an inspirational figure, an example to which to aspire, than other superheroes. He’s more than a symbol of his country, like Captain America. And even if this takes place in a fictional world, T’Challa is more concerned with how he can help his people throughout the world and reach higher than his forefathers. It’s clear how meaningful this material is to him and he also brings more of a personal touch to this story than we’ve seen before, notably in the story’s prologue set in Coogler’s hometown of Oakland, California. He has a vision here that reaches far beyond the Marvel Cinematic Universe and making an entertaining blockbuster. The ambition is truly impressive. Many will want Coogler to make a sequel to Black Panther and if he has more stories to tell, he may just do that. But just like he moved on from Creed when it looked like he might make a follow-up, Coogler is now in a position where he should be able to make any kind of movie he wants. And after trafficking in franchise filmmaking, he may want to go back to something smaller and more personal, then perhaps return to another big-screen spectacle. What he does next will be fascinating to follow.